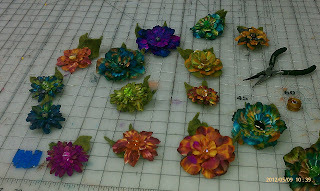 These are made from layers of paper petals that I dyed with alcohol inks. The leaves are made from scraps of hand dyed wool. If you would like to see them in person, I will be at The Juan de Fuca Festival of the Arts in Port Angeles this weekend, the street fair is Saturday, Sunday and Monday-hope the weather holds out!